Last year, we did a little performance for the girls at RSG, which helped us embark on the current project with them. 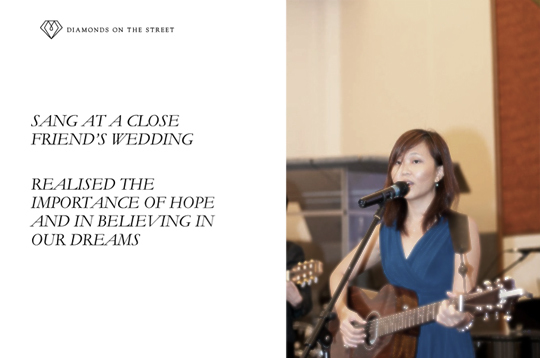 A slide from Crystal's sharing of her story from brokenness to hope. Oooh you make the corners of my mouth defy gravity! On Monday, with some fear in our hearts, we walked into Residence@St George’s (RSG) to begin working with a group of girls on the song, S-M-I-L-E. Entering a new community is always difficult. We have to make sure we’re sensitive to their way of doing things and living, and also be open to their personalities. Most of all, we just really hope they would like us. In this pilot run, ten girls from RSG will be collaborating with us on the lyrics and vocals for S-M-I-L-E.
Would they take to the song? Would they find it too la-la-happy-la-la? Would they find us boring?? Would they not want to join in at all?! In fact, our fears were unfounded. The girls were absolutely encouraging, and they participated in every segment of the workshop: from really breaking the ice during the ice-breakers and empathetically listening to Crystal’s story on Spasmodic Dysphonia, to attentively remembering the rhythm of S-M-I-L-E and attempting some lyric modification. One girl even described the song to be “as sweet as London Chocolate”. Well, we weren’t too sure about that as we have never tasted London Chocolate ourselves. But back on the Singaporean grounds of RSG, we actually heard the girls humming to S-M-I-L-E while they were heading back to their dormitory rooms after the workshop. That warmed our hearts. At least the song works. Meanwhile, we’re still trying to figure out how to better assimilate with the girls during dinner, which is a good time to get to know them better. We learnt that they love singing more than words or writing (not a surprise, really), so we’ve got to amp up the vocal portion, which will begin intensively from next week. Also, once we’ve gotten permission from the girls and their parents/guardians, we wish to do some explorations into their personal lives and histories. Our hope is that they can drive the storytelling aspect of this project in their own ways too.